With so many options of commercial soaps lining the shelves of grocery stores and supermarkets, why would anyone go through all the trouble to make their own soap from scratch? Soap is the product of a chemical reaction that occurs when mixing oils and lye, along with some water. The process is called “saponification,” in which the lye has been processed to help form the soap itself – there is no lye after this chemical reaction. But on your next trip to the supermarket or the grocery store, take a look at the labels of the products on the soap aisle. Despite the lovely packaging, alluring colors and fresh, clean scents, you’ll notice that most of them don’t contain the word “soap” on their labels. You may find “beauty bars”, “moisturizing bars” or “body bars”, but not soap. That’s because these products are not actually soap. They’re detergents. Detergent is a petroleum-based product, akin to gasoline. Detergents will leave the skin feeling very dry, or sometimes itchy. They contain synthetic lathering agents, artificial colors and fragrances and other harsh chemicals. Have you ever read the label of a store-bought “soap”? Were you shocked at the amount of synthetic ingredients listed there? There are ingredients such as alkali and DEA, Triclosan, BHT other unpronounceable chemicals that have been demonstrated to be detrimental to healthy skin and even linked to cancer. The problem is that even though companies are required to release information about the ingredients of the soaps they manufacture, one can never be too sure of all the chemicals listed (or not listed) on the labels. When you make your own soap from scratch, you get to control the quality of the ingredients you use, and ultimately what goes in what stays out of your soap. You can choose only the most natural, gentle and soothing ingredients to your skin. The ingredients that you put in your own soaps, if you teach yourself how to make your own soap, will determine the benefits that you enjoy. Often, with skin conditions such as eczema and psoriasis, the removal of harmful chemicals and possible irritants from the soaps used can greatly improve your overall skin health all by itself. Besides the base oils (fats) that will react with lye and form the soap, you can get creative and play with essential oils and other soothing, healthy and fragrant additives – such as herbs, clays, honey, cocoa, tea, seeds and much more – each offering their own benefits to the skin. For instance, honey can be a great moisturizing agent, while certain clays do wonders for oily skin. Working with essential oils can also open a world of possibilities. They are not really oils, but very powerful and concentrated extracts from leaves, flowers, stems, barks, roots or other elements of a plant. Anyone who has tried aromatherapy knows that essential oils are nothing like perfumes and synthetic fragrances. They are the true “essence” of a plant, and their use can provide valuable psychological and physical therapeutic benefits. Another benefit of homemade soaps is that you will retain full glycerin content. This is a product of soapmaking that is known to draw moisture from the air, and as a natural ingredient in soap, can moisturize the skin. Most commercial soap companies will mine the glycerin from their soaps, and will sell it in other products for the higher cost items. This means that most soaps and detergents have been stripped of this key benefit (so that you can buy moisturizers separately from these same companies). Think about that dry and cracked bar of soap that stood there in your bathroom for too long. That’s because all the glycerin has been stripped from it to make more expensive products such as moisturizing creams and lotions. If that’s what it looks like after a few weeks, just imagine what it will do to your skin! When you make your own soap from scratch, all that moisturizing glycerin remains intact and you will see a huge improvement on how your skin looks and feels. Main line soap manufacturers care more about their bottom line and how to increase their profit margin than they care about the health benefits to your skin. When you make your own soaps, you have different objectives in mind, such as moisturizing your skin, preventing rashes, eczema flare-ups, oily skin and dry skin and more. Finally, some people just make homemade soap for the fun in it. The process can actually be quite enjoyable, especially to those who love arts & crafts and cooking. It’s also a great way to come out of a hobby with a usable set of items. As for the soaps you make: you can give them out to your friends as gifts on special occasions, for example, or perhaps even sell them online or on crafts shows. Whatever you want to do with the soaps, there is something in handmade soapmaking for everyone. 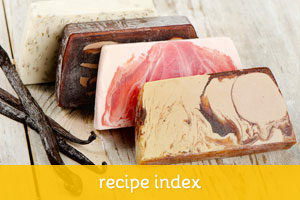 If you’re convinced on trying your hand at soapmaking, take a look at our soap making basics page. 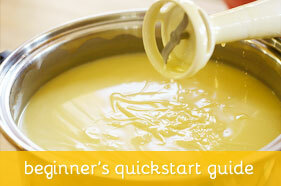 There, you’ll find important information to help you get started. For the seasoned, experienced soap makers that are just looking for recipes, check out our collection of homemade soap recipes.